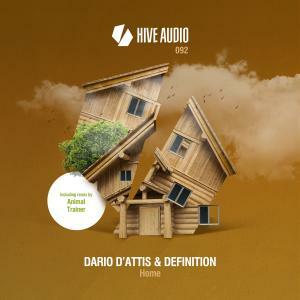 Mr. Dario D'Attis is a well familiar name to all those having followed Hive Audio over the course of the past years so it's always a pleasure to see one of our favorite Swiss friends coming back with a new one. Once again teaming up with Definition in the studio their new single named „Home “ is gonna make you sweat on the dancefloor and defo will help to burn some sweets away you've possibly indulged in a little too much for reasons at this time of the year. The original version of „Home“ provides a proper muscular House-flavored stomp for all dancefloors under a groove, weighing in most beautiful strings and a lively, elevating classic synth modulation as a foundation for deep, heartfelt male vocals and a touching atmosphere able to make people fall in love on the dancefloor within seconds. On remix duties for „Home“ is Animal Trainer who takes on a slightly different angle production wise and transfers the tune into a world of polished chrome, driven by pumping Tech House rhythms and clean, metallic synths as well as futuristic noises, sweeps and atmospheres meandering through the excellent sonic architecture of this rework.